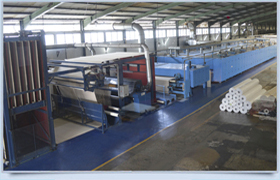 At Rainbow Carpet, our facilities are fully integrated with Tufting, Air Entangling/Twisting, Finishing, Printing, and PVC Tiling making it possible to produce wide assortment and styles at a competitive pricing point. 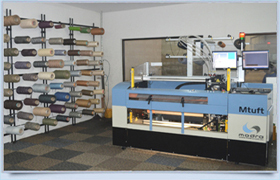 We use latest industry technologies from leading Global sources with Tufting Machines from UK ,Germany and USA, Modern Finishing & Back CoatingLline from Campen , Denmark, Air Entangling & Twisting machines from Belgium, PVC Tile Line from Austria & MTuft-Modra machine from Australia which gives us a leading edge in manufacturing world class quality carpets. 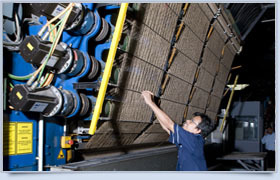 Our Strengths are availability of enormous yarn inventories keeping production lead times at its minimum. 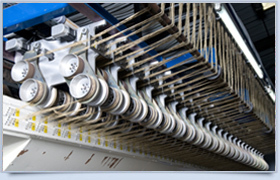 Exclusive use of STRUDON PP yarns, CAMIFIN Cable yarns, and AQUAFIL Nylon 6 yarns which gives high performance commercial and residential carpets backed by the market leaders in these Brands, confirming their strong and enduring warranties. 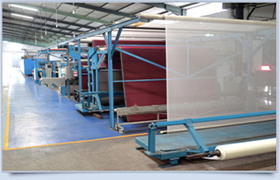 Adding feather to it, most of our Carpets are 3M coated to handle adverse environments. 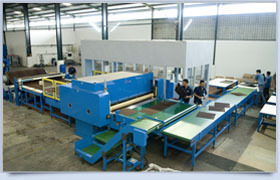 Our products are thoughtfully engineered to perform with total customer satisfaction. 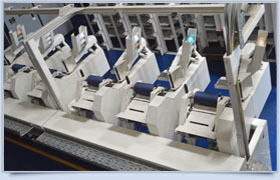 Our Tufting Machines from Germany, UK, and USA are equipped with latest technology, has the ability to do precision Loop piles, Cut-piles, Multi-level tufting, Scroll enhancements and Tip-Sheared qualities along with wide machine gauges and density range and yarn twist qualities to provide superior performance. With the recent addition of our ‘New Generation Campen Finishing Line’ from Denmark, Europe with Expertise in latex formulating techniques using rich Latex Blend, we possess the best Back Coating and Lamination with precision dimensional stability in the region. 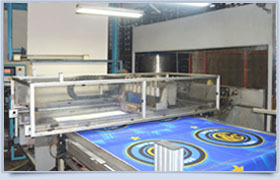 Our capabilities also include GEL BACKINGS with multiple Emboss Facilities. 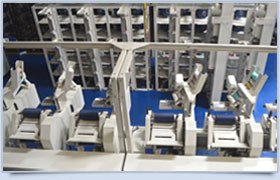 Our fully Automated Zimmer CHROMO-JET Printing Machine from Austria, Europe provides high quality computer controlled printing. 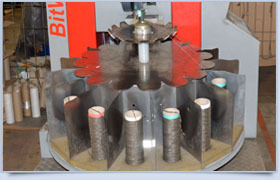 The pre-mixed pressurized spot colors are injected with precision deep into the face of the pile without any manchine parts touching the fabric. Powered by State of the Art Zimmer Infra-Red PVC Tile Line, our carpet Tiles give flawless and dimensionally stable precision quality. 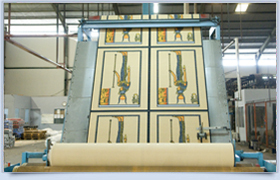 This offers many advantages over traditional broadlooms ranging from unique random designing taking flooring to a whole new different level. 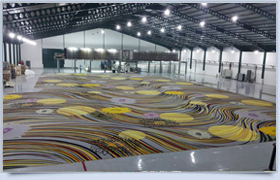 Our state of the art Vandewiele MAX91 is designed to weave Axminster carpet at high speeds with colors up to 16 colour frames. 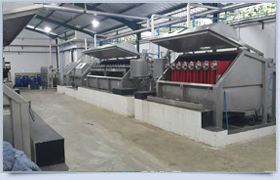 In addition our automatic Spray Dyeing Machine Novel liquor flow ensures perfect dyeing of hanked woolen yarns and critical fibres such as polyamides with the help of incorporated modern industrial PC controls. 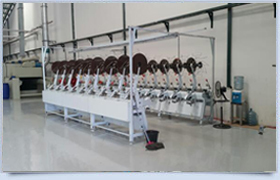 Morevover,Rainbow's Saurer-Peass Hank to cone precise winder has exceptional features with auto yarn length controlling device, constant yarn speed through smart controller,overfeed device to ensure best quality precise bobbins with uniform yarn tensions to the Axminster machine. 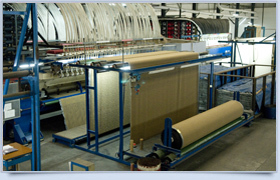 As a policy,We never compromise on quality , every single Rainbow’s Axminster Carpet is meticulously inspected at each stage of the production process, from the woolen yarn to the finished carpet with the help of Handsaeme inspection unit to ensure best international quality. 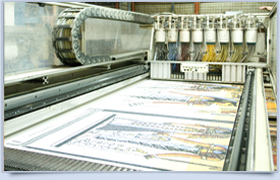 Our latest Ned-graphics design software together with Modra M-Tuft machine are fully in use to engineer wide varieties of excellent high quality designs to suit customers requirement. 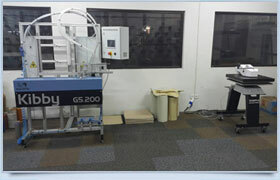 Rainbow’s Kibby machine can produce carpet samples quickly, efficiently and economically. With Kibby we can produce almost infinite possibilities in design and color of Axminster samples. Scotchgard is a substance developed by 3M to protect carpet and other fabrics from staining. Rainbow uses best version of Scotchgard for cleaning stains and getting them out of fabrics. Wall-to-wall carpeting can be frustrating to get clean because you cannot just pull it up and send it to the cleaners. With Scotchgard, you can avoid that frustration and keep your carpet looking as fresh and clean as it was when you installed it. 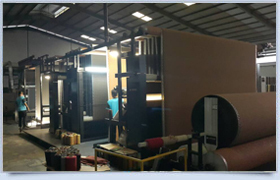 We firmly believe that by possessing the most advanced manufacturing equipments and technical processes, modernized management system together with sound marketing team, Rainbow Carpet is bound to grow up as the backbone of the Indonesian carpet industry.